Pamommy Loves to Run: Goals, racing and a giveaway!! Goals, racing and a giveaway!! Posting a day late but thought I would check my August goals and set some September goals and a GIVEAWAY!! 2. Complete the August Core Focus Challenge with Sneakers and Fingerpaints..... once again nope, didn't do it. I wasn't feeling challenged so I stopped. 4. Complete Plank challenge (doing one, 1 minute plank for the day #)... was doing fantastic and then the monthly stomach issues started and I took a break and then restarted. All in all, I think August went pretty good. I was plagued again with stomach issues, handled a bachelorette party, bridal shower, two orientations, sending my oldest off to kindergarten, sending my twins off to preschool for the first time, soccer practice, gymnastics, sports class, work and training/racing. I think they are all attainable. The rolling and soda goal are going to be tough. I drink probably one a day and LOVE them but we'll see what drinking more water does for me!! 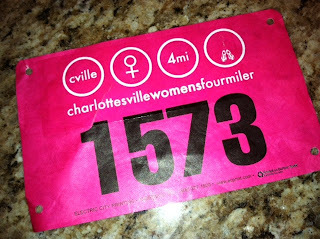 Now onto the review of the Charlottesville Women's 4 miler and the giveaway. I decided to sign up for this race on a whim one Saturday morning. A person from my running group posted on our page that registration was that AM and I signed up right away. It literally sold out in the first three hours so I was happy to get it. There were 3000 women total (not huge by any standard, but big enough). The race is in Charlottesville, Virginia. Not sure how many people are familiar with the area so here's the gist of the area. It's in the mountains, not real big ones but mountains none the less. The course thankfully was more rolling hills than steep inclines. I almost bagged the race, was not feeling it all week or the night before but I rolled out of bed a 530 and headed out. I have no pictures of my racing outfit but I thought I was cute. I wore my pink skirt, black "Sweat Pink" tank and my awesome compression socks from Sockguy. So here's the giveaway. The Sockguy gave me a pair of compression socks to review and wear during the race. I love great socks and love compression socks so here's the low down. They looked awesome and I did not cramp. The heat and humidity was super high and a lot of people were having trouble with the heat but I did fine. I loved them and will continue to hit up the site for more socks. Here's what they sent to me for a giveaway. They are a pair of "Save the Tatas" compression socks size small (womens 6-10). You know the deal, follow the rafflecopter giveaway!! I haven't purchased from them yet but I'd like to try the the Jack O for the fall marathon I'm training for. Never purchased from them. I like the Pink Mask one that they have. I haven't ordered from them before, but the candy corn ones are so cute for fall! I think I bought from the sockGuy at a marathon expo. I have never bought from the sock guy but I am glad I now know about it. I would get the splatter ones! I have not- but I woulod choose Flywt Expert Acrylic Ski !! I've never visited the Sockguy site before but just checked it out and I'm loving the polka dots! Never heard of the SockGuy. I like "Big Balls". I have not bought from them, but I like the purple dots no show. I have never heard of sockguy. I like the one you got though! Great goals for September! I've never heard of Sockguy but I love the "Love 2 Run Channel Air S/M". They are SO cute and their prices are very reasonable. I have Sockguy socks, but I bought them a long time ago and want to try compression socks! I like the Big Balls ones, haha!